I think it’s safe to say that we were all pretty excited to hear the announcement of Marvel’s returning “What If?” line of comics. They’ve always made way for writers to have a shot at a story that has potential for greatness but might otherwise be limited by continuity or editorial restrictions. 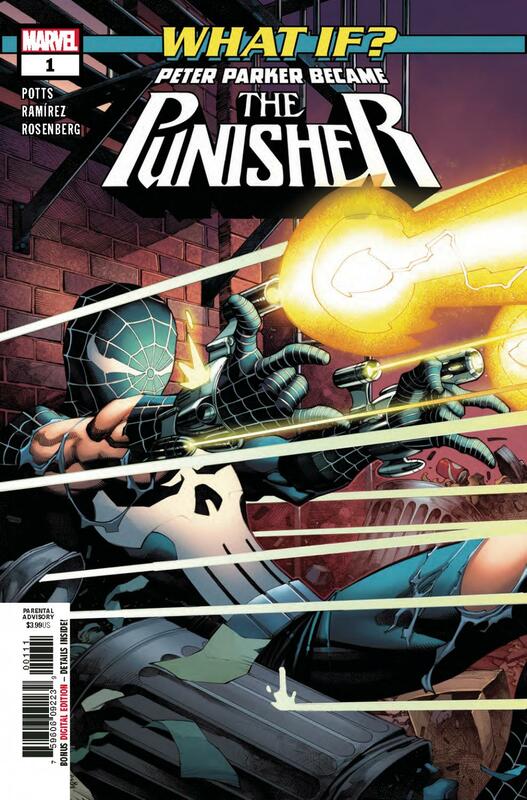 One of the most anticipated answers has been to the question: what if Peter Parker became the Punisher? Mild spoilers to follow. My biggest problem with this What If story is that it doesn’t feel like a traditional one shot. Instead, it feels more like a character’s origin story being recapped in the pages of another book. This isn’t inherently a bad thing, but I think it would have been more belonging to the What If line if it ditched the first person narrator. As for why this version of Peter becomes the Punisher – well, he just does. While 616’s doesn’t kill people, this one just… does. There’s nothing that puts him over the edge that shows us what could have been. He’s just already a killer, who just happens to come up with the Punisher skull symbol that we’re all familiar with, before he even kills anyone. It feels a little bit like there’s a step missing there. He goes through the same major beats of Spider-Man’s story, albeit slightly out of order, up until he decides he is Spider-Man no more. There lies my other problem with this story: even though he does kill his enemies, this Spider-Man doesn’t feel like the Punisher in any other way. He doesn’t go looking for fights and he’s not shown to be particularly brutal. This issue is entertaining enough, but I don’t think it reaches its full potential. Juanan Ramirez’s art is a healthy balance of gritty and playfully stylized, making him an excellent fit for a Spider-Man / Punisher mash up. Similarly, the faces are right for the script, since this Parker is written in a way that implies he’s still not quite socially developed. Sometimes less is more, though. Some lines meant to show shading or wrinkles don’t feel totally necessary in context and can make panels feel a little too busy at times. Rachelle Rosenberg’s colors cleverly bring a moody and dark filter to the book without relying too much on drab colors to avoid making the whole thing feel bland. They also enhance the field of depth in some panels, making the sights feel more like pictures than drawings. This wasn’t bad, but I am disappointed. People who are only interested in this book because they like it when Spider-Man kills bad guys will likely be satisfied, but even then, he’s mostly just shooting them in the chest. It’s not particularly gory. Those that wanted an analysis of what makes the Punisher and Spider-Man so different or what they might actually have in common will probably feel let down entirely. The art is enjoyable, but not so much that it makes this book a must read. If you want to know whether or not to give this one a chance, just go back and figure out which category I listed that you would fall into.